The people at Pillowtex � know how difficult it is to feel rested when waking up with aches and pains even after a full night of sleeping, so they created a product that can help. 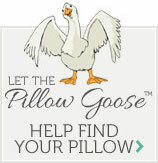 The Pillowtex � Triple Core White Duck Down and Feather Pillow not only provides comfort but will also support your head, helping to prevent those aches and pains. This support not only prevents those pains, but also helps you sleep more comfortably and therefore get more rest. Order today and experience it for yourself! Shop Now! Treat yourself and your family to a better night of sleep, because better sleeping means better living. FREE Ground Shipping! on ALL ORDERS to the Continental United States. All pillows are 100% Satisfaction Guaranteed! All orders shipping anywhere in the United States are eligible for FREE Shipping. Simply select FREE Shipping when you checkout and we will ship your order by UPS Ground, FedEx Ground or USPS Priority Mail. When we say FREE Shipping to anywhere in the United States we mean anywhere in the United States. We will ship orders to the continental United States and will even ship orders to APO and FBO addresses for FREE. Unfortunately Alaska, Hawaii, Puerto Rico, Samoa, Guam, etc. will be charged nominal shipping rates as there is no ground service available to those areas. Expedited shipping such as Next Day Air or Second Day Air shipping can be quite expensive because of the size of bedding. Cost for expedited shipping varies based upon where the item is being sent. All orders placed before Six PM Eastern Monday-Friday will be shipped the same day. Orders placed after Six PM Eastern Monday-Friday will be shipped the next business day. Orders placed on Saturday, Sunday or a Federal Holiday will ship the following business day. All items ordered from DownPillows.com come with a 30 Night Sleep Guarantee. If you return any portion of your order to us within one (1) year from the date that you place your order we will provide you a refund of the purchase price of any items as well as a FREE SHIPPING LABEL to return the products to our facility. If you choose to do an exchange or receive store credit instead of a refund you will receive full credit for the purchase price of all items returned. Please email us at Dream@downpillows.com to get your FREE RETURN SHIPPING LABEL and Return Authorization number prior to returning any items. Any shipments sent without a return authorization number will be refused. Refund Process: Upon receipt of the item we will refund your credit card with the purchase price of the item. We reserve the right to contact your credit card company in order to verify that an address is approved for shipment under Address Verification Guidelines. Orders shipping by ground should arrive within 7 business days after the order is placed; however, please allow for 8 days.